Revealed to huge fanfare at the 2013 Geneva Motor Show, Ferrari’s LaFerrari is the Maranello marque’s latest state-of-the-art hypercar, following a rich bloodline of ultra-exotic limited production models from the celebrated Italian sports car maker, including the 288 GTO, F40, F50 and Enzo. Despite being Ferrari’s fastest production road car of all time (with a claimed top speed of 217 mph/350 km/h), this 950 bhp hybrid supercar is also one of its most economical, using 40 percent less fuel than a ‘regular’ V12. LaFerrari mates an 800 bhp 6.3-litre V12 internal combustion engine with an electric KERS motor – perfected in F1 racing, and producing an additional 150 bhp – to provide extra thrust during acceleration. This catapults the car from 0-62mph in under three seconds, making LaFerrari nearly as fast as a modern Formula 1 car, while also trimming emissions and fuel consumption. The total LaFerrari production run of 499 examples, each priced at over £1 million, sold out instantly, and the example set to join 60 other rare and outstanding cars at Hampton Court Palace from 5-7 September will be one of the very first to be delivered to its lucky owner. 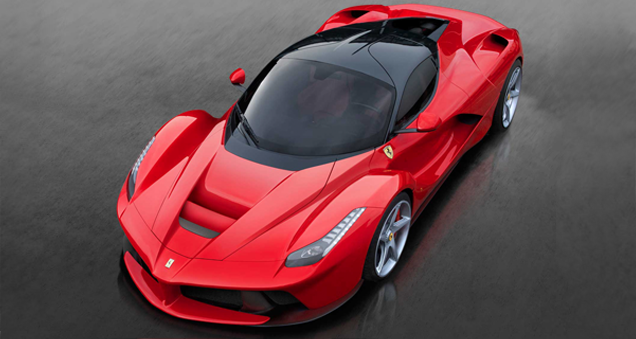 LaFerrari will be joined by other exciting and exclusive mid-engined supercars at the 2014 Concours. These will include the actual 1966 Le Mans 24 Hours race winning Ford GT40, plus two rare 1970 prototypes; the wild one-off Bertone Lancia Stratos Zero, with interior entry via its windscreen, plus one of only six AMC AMX/3 prototypes.